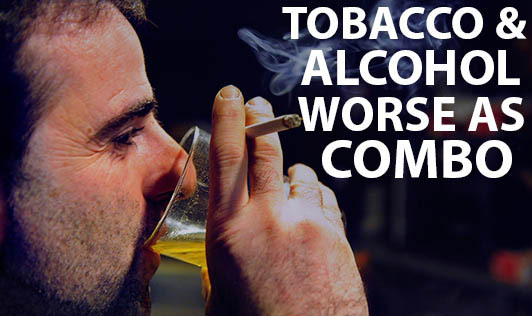 The finding adds to mounting evidence that tobacco smoke and alcohol are worse for health as a combination, beyond the individual exposure risks. "This new data is a significant finding considering the combined effect of alcohol and cigarette smoke exposures, and the implications for public health". The researchers reported on mice exposed to smoky air in a laboratory enclosure and fed a liquid diet containing ethanol, the intoxicating ingredient in alcohol drinks. Mice exposed to second-hand smoke and who drank ethanol had 110 percent more liver fibrosis proteins than mice who breathed filtered air. Additionally, the twice-exposed mice had 65 percent more liver fibrosis proteins than mice that breathed smoky air but did not drink ethanol. Fibrosis is scar-like tissue in the liver that can lead to cirrhosis. Myth- If you turn red while drinking alcohol, it means that the liver is taking care of all the alcohol you are drinking. Fact- The turning red after having alcohol is called" Alcohol flush reaction". Basically, you have an inactive enzyme that isn't doing its job of breaking a certain toxin down. That toxin builds up and makes you red. Myth: The mother must avoid yellow clothing and yellow foods, when she is feeding her baby. Fact: There is no scientific evidence to support that eating yellow foods (dals, vegetables, fruit or drinks) cause jaundice. The color of one's clothing cannot cause jaundice in a baby. Myth: Cholesterol medicines harm the liver. Fact: Cholesterol-control drugs do have side effects. But they are mild, can be detected through blood tests and are reversible. Such drugs are very effective in lowering the risks of death and disability through diseases of the blood vessels. Myth: Eating fat-free boiled foods hastens liver recovery in hepatitis. Fact: Conversely, it prolongs the illness and often makes the patient nutritionally deficient. One should take a well balanced diet which is easily digestible and too much oily and deep fried foods should be avoided. Liver filters over a liter of blood every minute! !